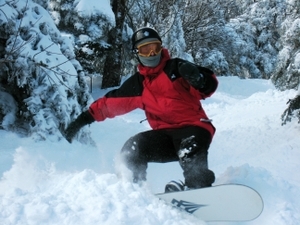 On a frigid and windy day at Jay Peak, the tram swung to and fro as it carried passengers to the top of the mountain. 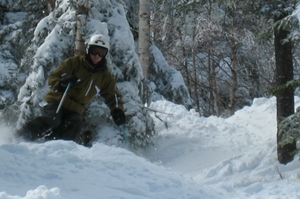 The powder-choked face chutes and upper glades awaited. I watched from the lower lifts. My group had one claustrophobe, another acrophobe and another with a rule against entering aerial trams when wind gusts reach 70 miles per hour. 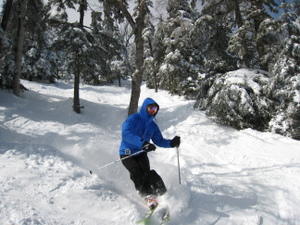 Jay's staff did a fantastic job getting the tram and the upper mountain open Saturday. But we weren't going to make the trip. The Jet and Bonaventure lifts kept us busy riding soft snow and powdery glades all day, and our lower vantage point gave us a great view of the hard-cores lining up to shoot the chutes. With nearly 2 feet from Thursday to Friday, the steepest upper mountain lines were in prime condition - and they hadn't been touched since the storm ended because of wind-related lift holds. We watched as the best skiers on the mountain picked their spots then shot themselves through to the powdery apron below. It gave us a good sense of what Jay can offer. If the wind ever dies down, maybe we'll check it out from the top looking down. Soft snow wasn't restricted to the upper mountain, though. 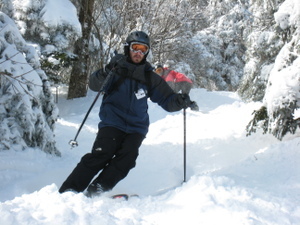 It also filled the mid-mountain glades, where these pictures were taken. And here are some photos from the real professionals. 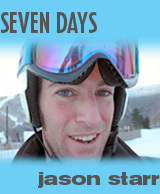 too bad you couldn't get to those chutes stare-ski...some sick terrain up there, and conditions were sweet.